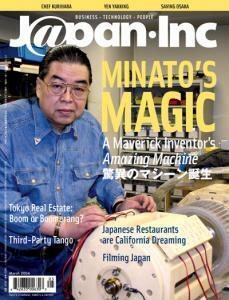 On the cover: Inventor Kohei Minato hovers over his machine in his Shinjuku workshop. --Intervention Junkies -- Addiction Without End? But service and standards may be worlds apart. She's called Japan's Martha Stewart, but Harumi Kurihara is her own homemaker. Tokyo Real Estate: Revival or Risk? Will booming development in central Tokyo sink Odaiba -- and everyone else? Can Japan stand a surging yen? Tokyo Designer's Week marries commerce to art. Kansai's largest city is urban and ugly -- but it didn't have to be this way. Our generous glimpse at a Japan you only thought you knew. For 30 years, maverick inventor Kohei Minato has been toiling away on his masterpiece: a magnetic machine that produces more power than it uses. Now, he's ready to take it to market. Two British expatriates make Japanese films with Japanese characters and settings. Richard Donovan visits them to find out how and why. Consultant Peter Presley offers sage advice and not a few scary anecdotes to show us how to handle third-party relationships inside Japan. On manipulating tax money and monkeying around.